Anyone can go to a shop and buy a card but it’s just as easy to make your own. 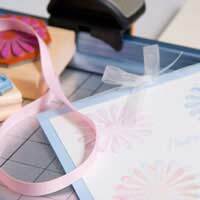 Read our guide and get some ideas on how to produce your very own handmade cards! Making your own cards is very easy. It’s inexpensive and requires only basic supplies that you will probably have lying around the home. It’s also very rewarding – a personal touch should never be underestimated. There are two ways you can go: you can use a computer and produce a sophisticated and high-tech card which could be printed out or emailed to the receiver. Alternatively, the other option is to get the scissors, card, glue and glitter and you’re your own in the old-fashioned way. The choice is really yours and we will give you some tips for both. If you want to make a card for a loved one and you are going for a polished finish, using a computer may be your best bet. All you need is one with some clip art functionality and perhaps some photo software so that you can adapt pictures for the front of the card. Start with your concept – are you going to be using a photo or are you planning to use pictures? All you need is your chosen photo to be uploaded onto your computer. Then open your photo editing software and crop it into the shape and size that you want. Whilst you are there you can even add some special effects or simply flatter the star of the picture by doing some gentle retouching! Add a caption to the picture – this is often what makes the card look professional. Think of a sentence or a punch line that can be taken over to the inside of the card. Choose a font that you think fits the style of the picture and you are done – all you have to do is print it out onto card. There are plenty of templates offered by websites and by your installed software that you can take advantage of. These are particularly useful when both inspiration and time available is at a low! Pick a theme and customise it as much as you can with a phrase that perhaps has a special meaning for both of you or add a picture that you know she or he adores. You can really be as creative as you like! First of all, cast your fears aside. This isn’t an art class test. You don’t have to be creative to put together a greeting card - all you really need is a little bit of time for experimentation. Let’s start with the basics first. You need scissors, card, in a variety of colours, some images, either photos or pictures from magazines or printed clip art from your computer, glue, sparkles and glitter, rubber stamps and ink and anything else that you want to adorn your card. Get pictures or shoes, a handbag and also get hold of a ribbon, tied into a bow. Get some coloured card and cover with a pretty striped wallpaper material. Keep the colours pink and pastel. Then place the pictures of the bag and shoes on the front, gluing the bow on the top left of the card. Write happy birthday on a small bit of folded card – make sure that handwriting is perfect – and glue the miniature card onto the front. Finish with a sweet message inside. Thank you card -Keep it simple with this handmade card. Christmas Card -The quintessential festive card feature Christmas trees, snow and a starry night! Start with some blue card, this is the base for the card. fold it in half and place it in a panoramic position. Next cut some white card which should be placed on the bottom right of the card. It is going to be the snow so shouldn’t be cut too straight. Then its time for the trees. Green card is a must and you should try and create the perfect Christmas tree shape. Cut out three separate trees and line the edges of each with glitter to create the effect of lights. Place them on the snow. Using some silver card, create small stars you only need about 6 and glue them onto the blue background. Write Happy Christmas on the front in a silver pen. The piece de resistance to any handmade card is the information written on the back. The signature proves that it was your creation! You can either rubber stamp your name or draw it on with the all-important copyright added on for good measure!Making your own cards is fun, cheap and the perfect outlet for your creativity. Get thinking and get creating!